Boston Marathon bombing survivor Jeff Bauman and his rescuer, Carlos Arredondo, threw out the ceremonial first pitch last night. Bauman had both his legs blasted off and Arredondo held his severed artery shut. Arredondo couldn’t save his own sons, one who perished in the Iraq War and another who took his life out of grief for his slain brother. But he could save another man’s son. It was the first time the pair had been honored together since the terrorist attack. This game was enjoyable not just because we could honor true heroes but also because Pedro Martinez visited the booth. 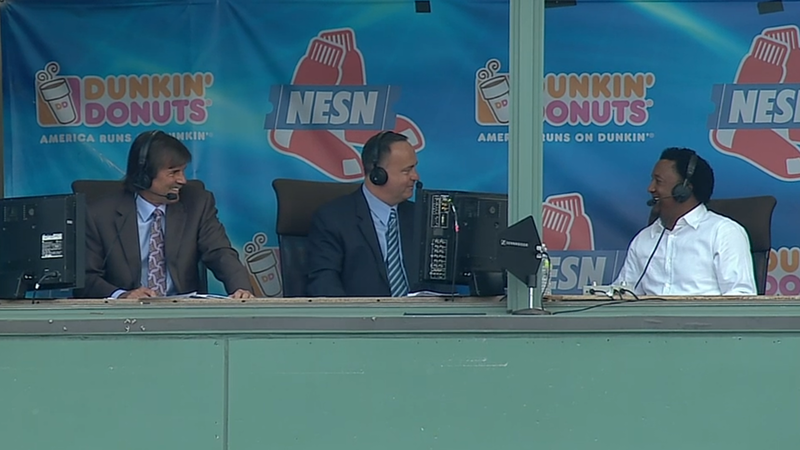 Adding to the mix was Dennis Eckersley, who was filling in for Jerry Remy. It was amazing to hear two all-time greats talking about how and why a current ace, Cliff Lee, was dominating the home team. Pedro stated that one of his idols was Reggie Jackson; he even spent his last dollars on a ball autographed by him. I can’t wait for him to rib Jackson about that, just as Rickey Henderson did when, as a young fan, he was handed a pen with Jackson’s name on it rather than an autograph. Eck said Juan Marichal was his icon and said he was surprised that Pedro didn’t name him, too. Pedro said in the poorly developed Dominican Republic they didn’t get to see many games, even of their own countrymen. Boston didn’t win the game last night, but we were winners nonetheless.